How is our event different? The Athletic Events at the Elk Mountain Games include the Scottish Heavy Athletics as well as an Edged Weapons course. Our event aims more for a Folk Life Festival that brings in all facets of our community to come together and celebrate the return of Spring! May Day is an ancient holiday that celebrates the return of Spring. It is celebrated throughout the Northern Hemisphere and is a public holiday in many countries with festivals and May Pole dancing. Can I compete in both the Edged Weapons Competition & Heavy Athletics Competition? No, not at this time. Competitors can pick one or the other to compete in, but we are unable to accommodate people wanting to compete in both. The competitions go through a series of events and having a competitor be in both competitions would disrupt the flow and order for all competitors. Competitors must be 18 years or older to compete and they must sign a waiver. There is a $25 entry fee to compete in the Heavy Athletics and Edqed Weapons competitions. More information and registration forms are under the "athlete registration" section of our website. How old do you have to be for the Youth Athletic events? Youth athletics are open to young people, ages 12 - 17. See our "athlete registration" page for events and times. 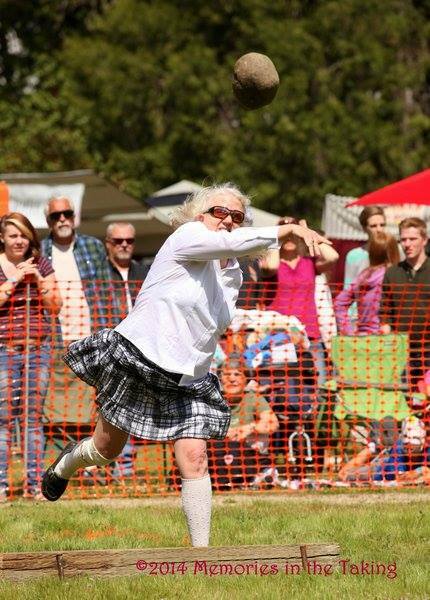 Do I have to wear a kilt to compete? You'll have better luck if you wear a kilt, but it is not required. A good attitude is the most important thing to bring! This sounds fun, how can I volunteer?